At the same time as the most of the rest of the Big 12 is underachieving, preseason favorite Kansas once again is exceeding expectations. The Jayhawks, who have captured eight straight Big 12 titles, appear destined to extend that streak with ease after they punctuated a 10-1 start by going to Columbus on Saturday and taking down seventh-ranked Ohio State 74-66. When Kansas was last challenged in a November loss to Michigan State, the Jayhawks crumbled down the stretch because they had yet to determine who should have the ball in his hands late in close games. Senior point guard Elijah Johnson, top big man Jeff Withey and talented newcomer Ben McLemore were all options, but none seemed ready to inherit that role from Tyshawn Taylor and Thomas Robinson. One month later, it's clear McLemore has embraced that role and his more experienced teammates have allowed him to seize it. The 6-foot-5 wing scored a game-high 22 points, helping Kansas pull away with a pair of foul shots, a 15-foot jumper and a dunk off an inbound pass to extend his team's lead to 62-52 with five minutes to go. On a court teeming with All-American candidates, McLemore was clearly the best player. 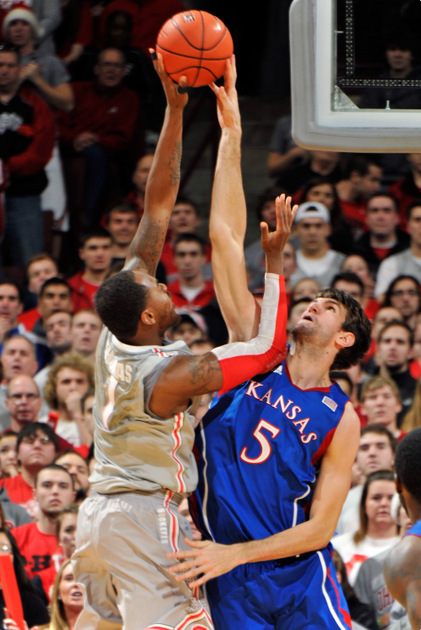 If McLemore was half the story of Saturday's game, then Kansas' fierce defense was the other half. The concern for Ohio State entering the game was whether any other players could emerge as weapons if Kansas focused its defensive attention on slowing down prolific scorer DeShaun Thomas. Shannon Scott complemented Thomas' 16 points with 15 of his own, but no other Buckeyes scored in double figures. West Virginia and Texas have underachieved, Baylor and Kansas State have been erratic and Oklahoma State has probably been the league's second-best team. Meanwhile Kansas has kept rolling along, down to superstars from last year yet right where it should be in its quest to extend its league title streak and return to the Final Four.